I work for an association management company, which manages twelve not-for profit associations. One of our services is putting on their annual meetings, which obviously requires a meeting planner. One of the women in the office was just notified that she passed the test and received her Certified Meeting Planner (CMP) designation. 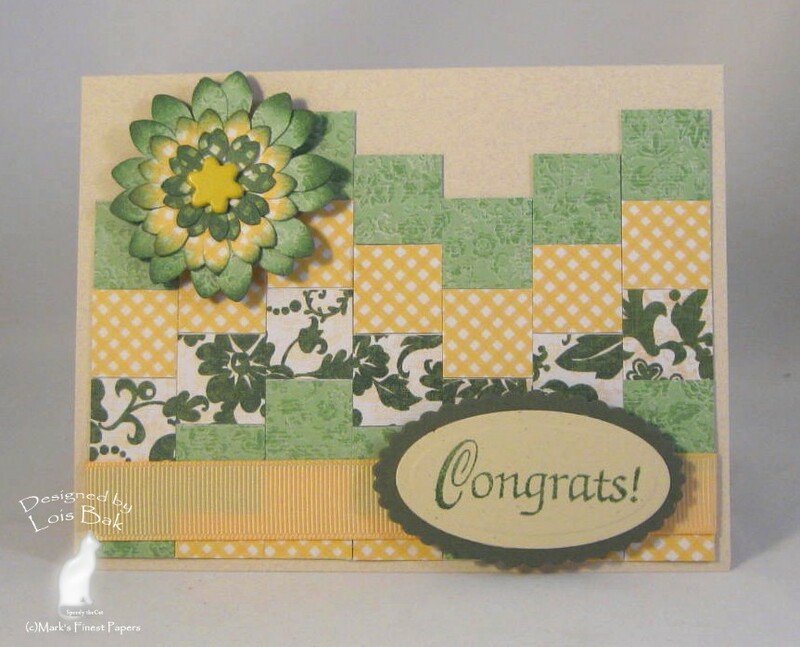 I made a congratulations card for her, using the Bargello Design technique, this week's Technique Challenge on SCS. 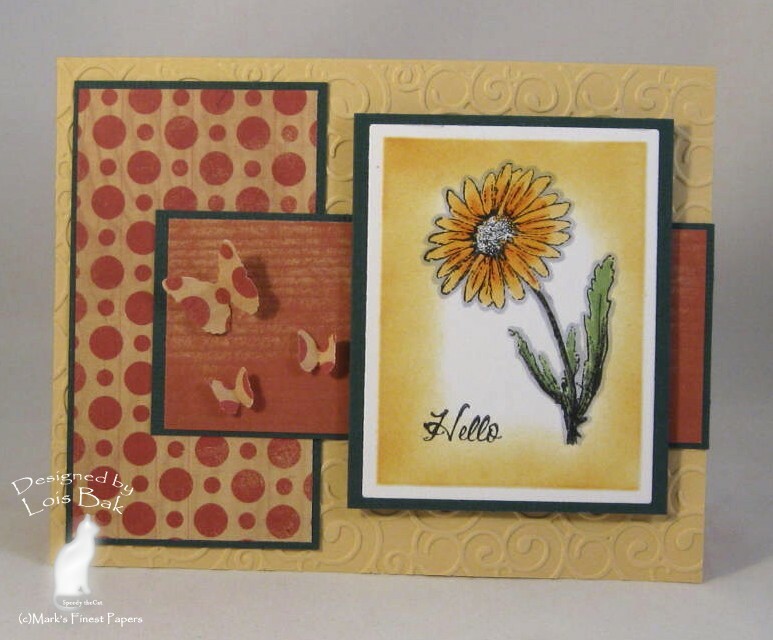 This card also qualifies for the Stampin'B challenge to use a flower on your card. 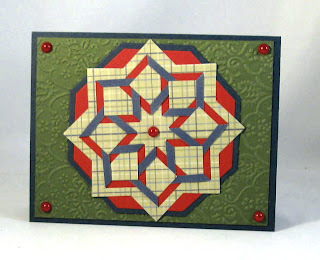 Following the direction Joan Ervin gave for the Bargello Design, I used papers from g*c*d studios' Melody Ross paper pad for the strips. I made the flower using several punches, then sponged around the edges and put together with a brad. The sentiment is part of an all-sentiment set from Mark's Finest Papers set called Flourishes and Frame. This is another card I made using that same technique, using papers from DCWV's The Crafty Stack and images from Mark's Finest Papers' set called Sew What? Last weekend I drove to Clearwater, Florida (about a 2-hour drive) to attend StampFest By the Bay along with my sister, my friend and her sister. It was a great girls' weekend. We participated in the Make and Take, getting to use some of the new products the vendors had. 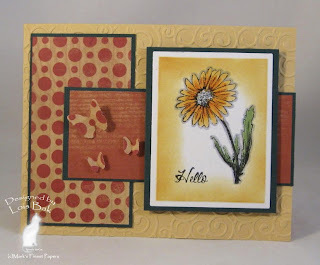 My first card today is actually for the Stampin'B's challenge this week. I was the hostess and asked the team to create a monochromatic card. I used one of the new toys I purchased at Stampfest -- the Cuttlebug frame folder -- actually part of a four-folder set called Heritage. 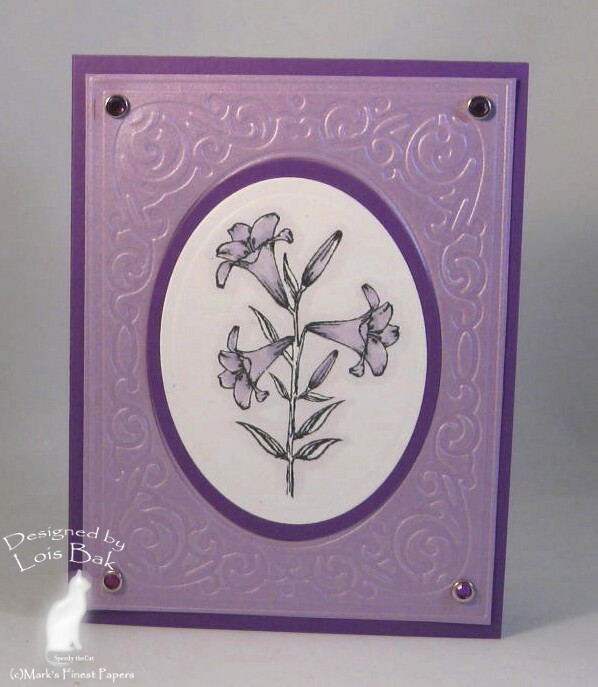 I embossed the Mark's Finest Papers' Lavender Sparkle and then mounted the stamped and matted lilies on it, adding some gem studded brads at the corners. My next card actually has no stamping at all. This was my first attempt at using a Geo-Die -- what a neat concept! You run your two-sided DP through the Cuttlebug and then bend back the cut-out portions to form the geometric pattern. 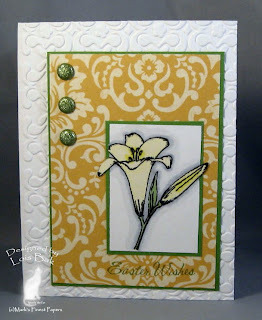 This card was made with a Cuttlebug embossing/cutting folder and then sponged. This was actually an experiment -- it might be a little too busy to use very often. My final card (my sketch challenge card for Wednesday) using my new toys also features one of the embossing folders in the 4-folder Heritage set from Cuttlebug/Provocraft. 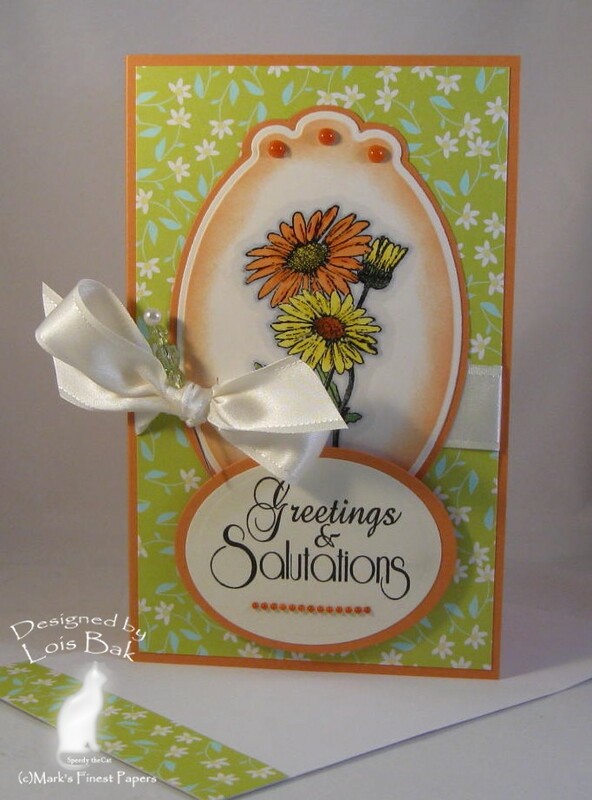 The daisy image is from Mark's Finest Papers' new set, Greet the Day with Gerber. I hope you enjoyed looking at some of the creations I made with my recent purchases. Thanks for stopping by. 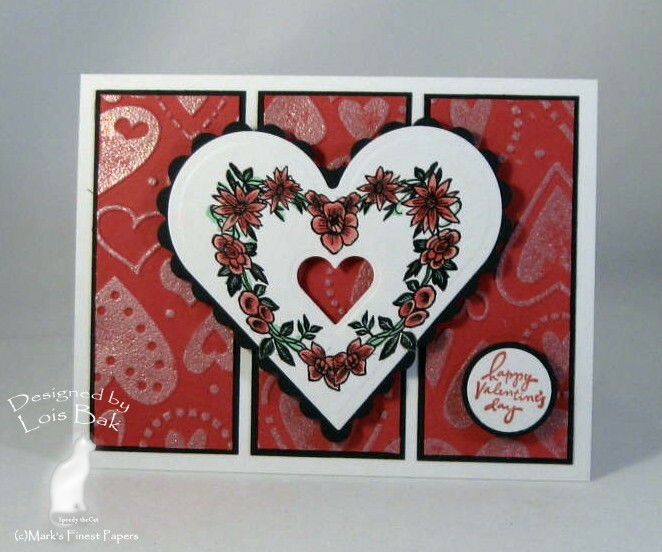 Welcome to the MFP February Blog Hop! This month, we are releasing 4 NEW SETS! 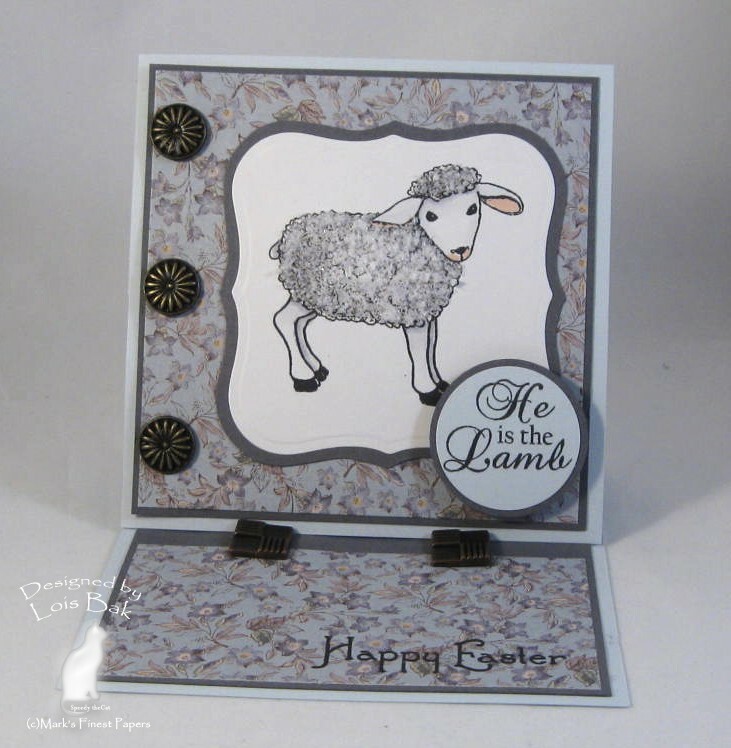 Our New Sets are: Greet the Day with Gerber, Big Cats, Spring Has Sprung and He is the Lamb. For your convenience, all 4 stamp sets are available for purchase TODAY! We have a BRAND NEW Blog Candy Contest! BE A GUEST DESIGER! All Blog Hop participants will have the chance to win a Month Long GUEST DESIGNER position on our Senior Design team! That’s right! ONE lucky winner will receive a Guest Designer package that will include March 2011’s Four New Release sets, a selection of Premium Papers, and beautiful embellishments. The winner will also receive a Guest Designer Watermark, Blog Button and have the choice to participate in the March 2011 Blog Hop! What do you need to do to qualify? Just comment on the Design Team blogs during the blog hop. EACH DAY that participants comment on all the Design Team blogs, their name will be entered once in the random drawing. Each participant has the opportunity to have his/her name entered up to four times. (There are four days of the blog hop, so there are up to four entries per person.) The winner will be announced on the Mark’s Finest Papers blog on Saturday, February 12, 2011. 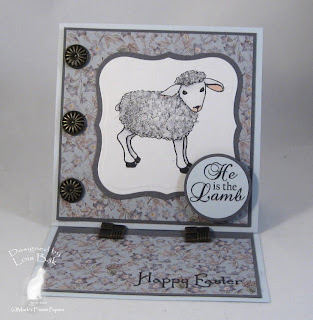 While I'm not officially part of the Blog Hop today, I'm glad you stopped by my blog to see what I created with He Is the Lamb. My first project is a laced luminaria, which I made following the tutorial on Splitcoaststampers. While the tutorial advises not to use a real candle, I did place a glass inside in which my candle rests. 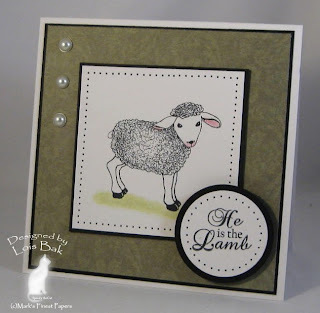 I made an easel card to spotlight the larger lamb in today's set. After coloring and mounting him on the easel, I added some Polar White Flower Soft on the "fluffy" part of the image. The DP is from a pad of K & Company beautiful DP called Julianne. Thanks for stopping by today. To be sure you get another chance to win the prize package, be sure to visit the official members of today's hop. Today's set is called Spring Has Sprung. 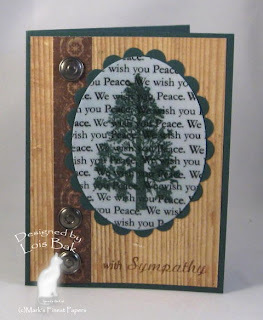 My first card is not only for the MFP Blog Hop but also doubles as my Stampin'B challenge card. Our hostess this week, Brenda (a/k/a Benzi on SCS) wanted us to use a bird on our card. A duck is a bird -- right! 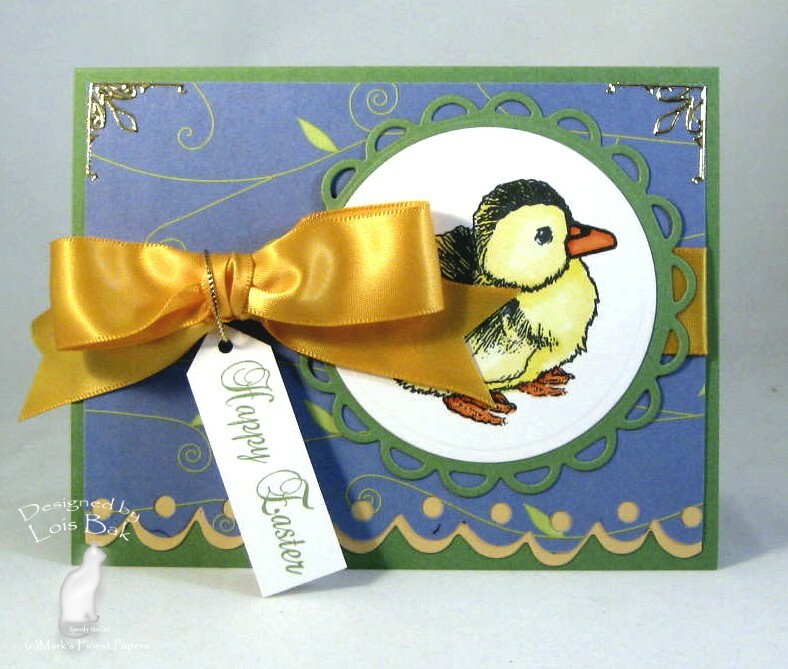 The cute little duckling is colored with Copic markers and cut out using a circle nestie, matted with the lacey circle. I just bought one of Tim Holtz's Sizzix On the Edge dies and thought it would look good across the bottom -- using both sides of the die. I've made a couple Tri Shutter cards and found them quite fun. Using the alternate measurements (5 x 10 1/2 inches) my card folds up to 3 1/2 x 5 inches. I used Basic Grey Urban Prarie DP for all the panels except the center ones. 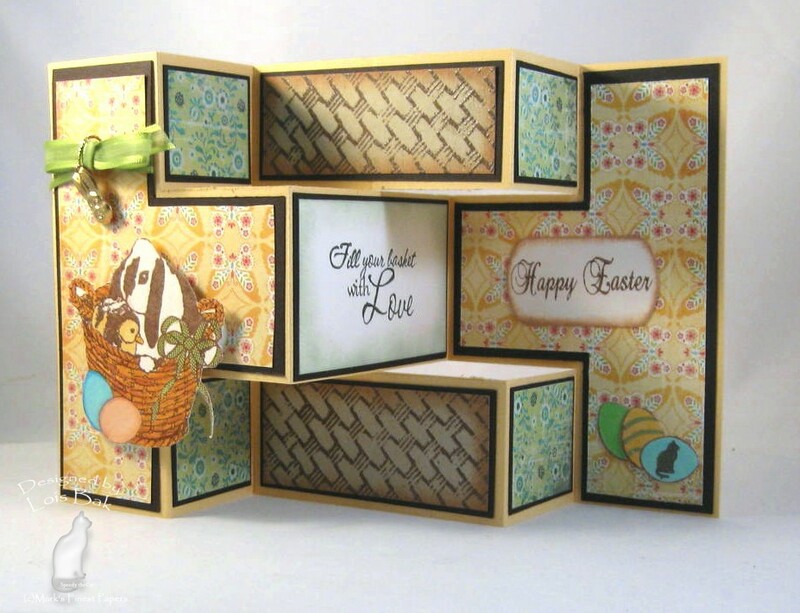 The upper and lower center panels are actually stamped with the basketweave stamp from MFP Background Fun on MFP Desert Sand cardstock. 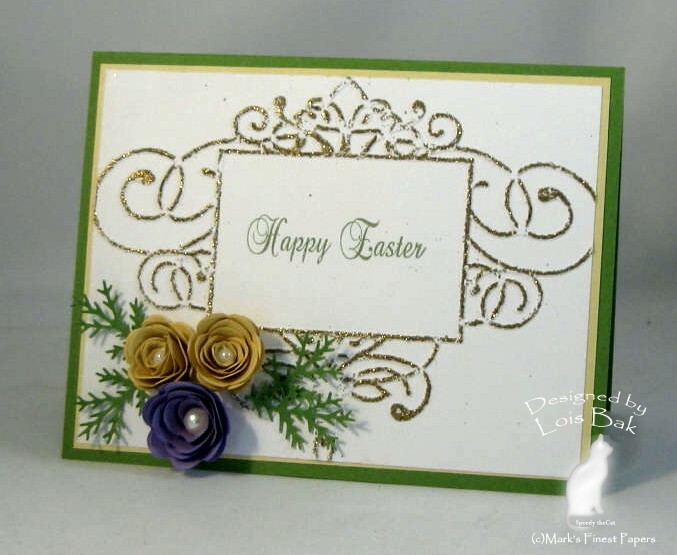 I stamped, colored and cut out the Easter basket on the front and the eggs on the back (stamping the watermark stamp of Speedy the Cat on one of the eggs). Be sure to check out the rest of the DT's blogs and comment on each to enter your name in the random drawing. 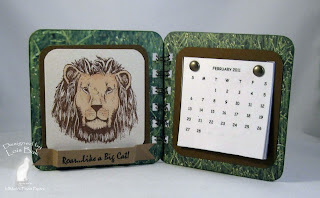 My first project for Big Cats is a chipboard calendar made following the tutorial on Splitcoaststampers. I used some coasters I found in the clearance bin at Michaels right after Christmas -- eight coasters for a dime! I covered the coasters with some DP from a DCWV Photo Stack -- grass. Using my Bind-It-All I connected the two coasters and added the lion image and the calendar. 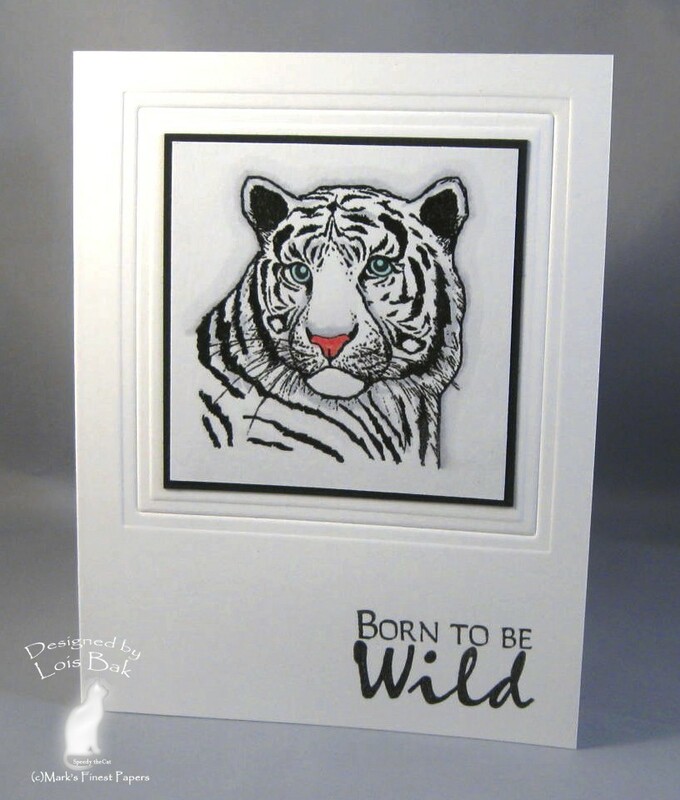 I must confess that this tiger card is my favorite project of the month. He is stamped on MFP White Storm 100 lb. cardstock. Because he is a white tiger, there is very little coloring -- some gray shading, the pink nose, and the blue eyes -- all with Copic markers. I matted him on black and glued him to the cardbase. Then I used a square nestie and embossed the frame around the black square. The final touch was the sentiment. 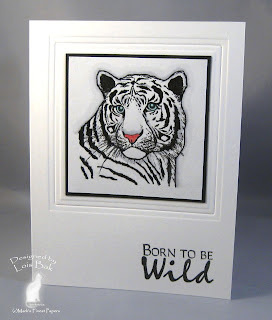 Be sure to visit the rest of the DT blogs to see what they have created with this "wild" set. My first card for this month's hop is an outsized one (4 1/2 inches x 7 1/4 inches) -- made to fit in some envelopes that my daughter gave me. 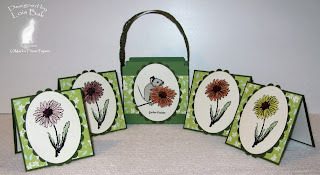 The large gerber daisies were stamped with Versafine Black Onyx on MFP Speedy the Cat's Cream and then colored with Copic markers. I then cut it out using the next-to-the-largest Labels Ten die and sponging with Tim Holtz Distressed Orange Marmalade before removing the die. 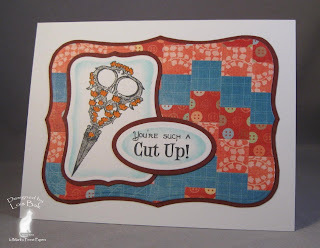 In order for the mat to be narrow, I traced the same die onto a piece of MFP Florida Peach (the same paper as the card base)and cut it out with scissors. This gives the nice narrow 1/16" border. The sentiment panel was cut with regular Oval Nestabilities, and I added the row of small orange pearls under the sentiment. I added some larger pearls to the image panel, ran some ribbon and made the bow, and then used a corsage pin with some pale green beads. For my second project I used the tutorial on Splitcoaststampers for the 3" x 3" notecard purse. 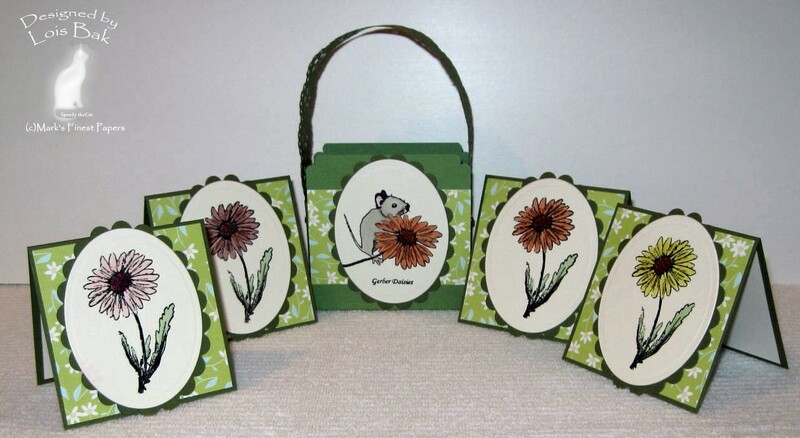 For the cards I stamped the single gerber daisy and colored each one a different color. I used the cute little mouse for the purse. The handle for the purse was made using a Martha Stewart punch. The DP on the notecards is the same as what I used for my large card -- Rubber Soul Meadow's Edge. Be sure to visit all the blogs in the hop so you are in the running for the prize package. I haven't been too faithful with posting on my blog lately, so I thought I would play a little catch-up by posting some of my SCS challenge cards for the week. This card is for Speedy's Friends' challenge on the MFP Blog -- to use hand made flowers. 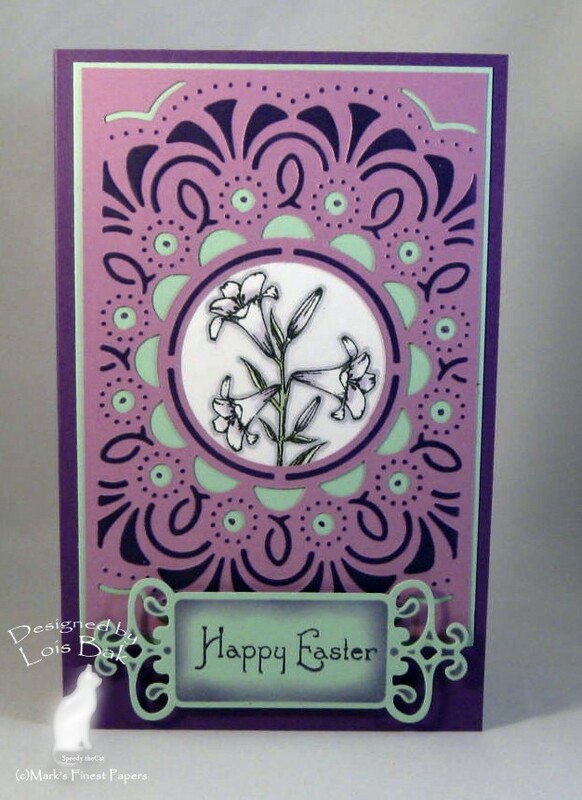 The three flowers were made with the Sizzix Rolled Flower die. 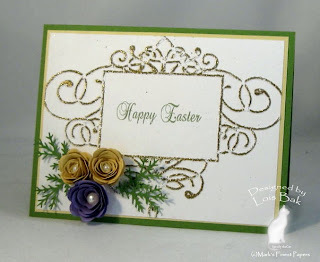 I also used Monday's technique challenge -- embossing on embossing -- Gold Tinsel embossing powder on the Cuttlebug embossing folder. Friday's Free 4 All challenge was to do an "almost-monochromatic" card. This photo was actually taken AFTER I posted to SCS. You were only allowed one other color other than neutrals. I added the pink in the ears and around the mouth later. 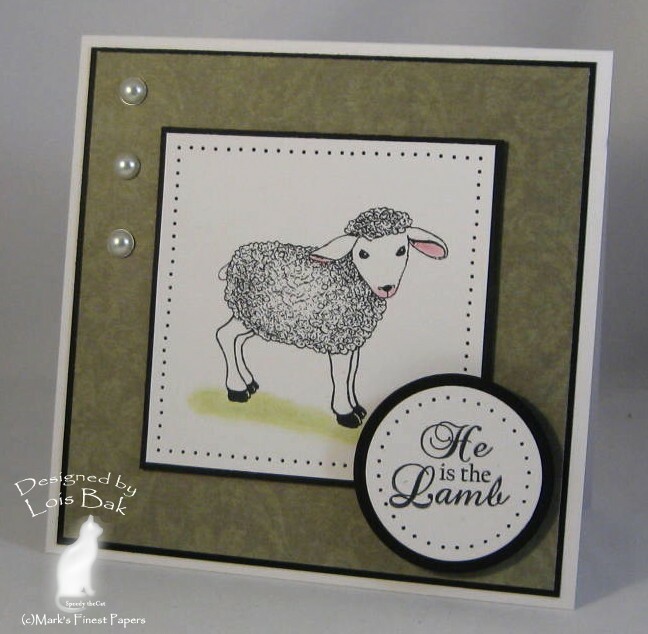 This card was made for Wednesday's sketch challenge -- and it's a sneak peek of a new set (He is the Lamb) being released next Tuesday by Mark's Finest Papers. Actually the card above is also a sneak peak of the same set. This was my original card for Monday's technique challenge. 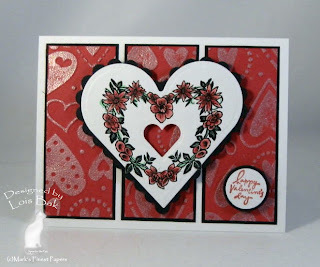 I used Ranger Bridal Embossing Tinsel over the Sizzix embossing folder to create this valentine. Thanks for stopping by and taking a look at my cards. 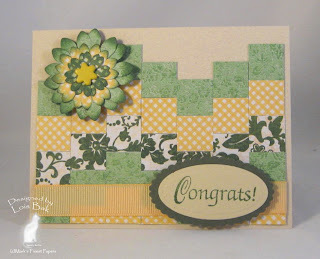 Vicky Gould really gave the Stampin'Bs a good challenge this week -- use the Embedded Image technique. When this particular technique was part of a Splitcoaststampers' challenge a couple of months ago, it took me four times to get it right. I found that the secret was to use REGULAR embossing powder, not UTEE and not Detail embossing powder. 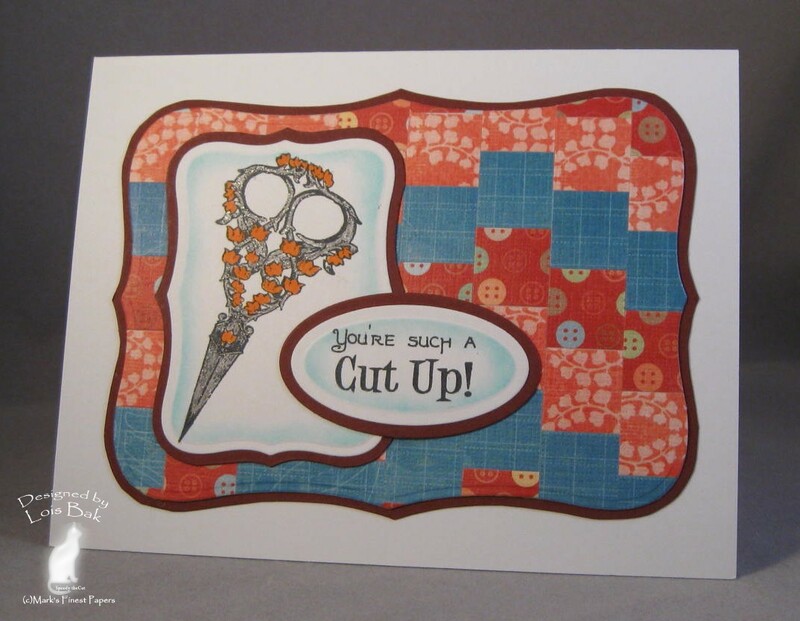 I stamped the background sentiment over and over on the pale blue cardstock and then cut out the oval. 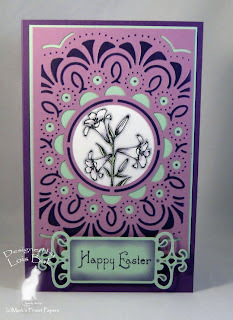 Using Versamark and regular clear embossing powder, I embossed the oval three times. Then I stamped the pine tree in Versamark on top of the now-shiny oval and embossed with dark green embossing powder, allowing the image to melt into the clear. The DP is from Cosmo Cricket's Wanted pad. I stamped the sentiment right on the woodgrain with Versafine Sepia and clear embossed it. Then I added the three brads to the darker strip. Thanks, Vicky, for the challenge.